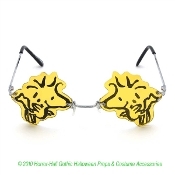 Part sunshine, part bird of mystery, Snoopy’s adorable yellow feathered friend BFF Woodstock has a lot of style packed into his tiny frame, and now he's bringing that flair to frames you can wear! Guaranteed to produce smiles, these officially licensed retro Charles Schulz Peanuts comics cartoon character rimless frameless lenses sunglasses feature UV 400 protection, and are as comfortable to wear as they are adorable. *Easy to see through. -Approx 5.25-inch (13.13cm) from temple to temple.